At the beginning of each school year, we publish the poster in this article, reminding our community that school buses are back on the roads. Today is a day to again remind drivers of this important message and the "...something much, much worse" that could happen. The Tippecanoe Valley School Corporation in Fulton County is experiencing the unimaginable tragedy of having three of their students killed and a 4th student injured this morning. The students were struck by a truck that ran the stop arm of the school bus as the students were crossing the road to get on their bus. Tipton bus drivers are vigilant in watching out for this danger and protecting our children. They report violators whenever they can get the license plate number and description of the vehicle. 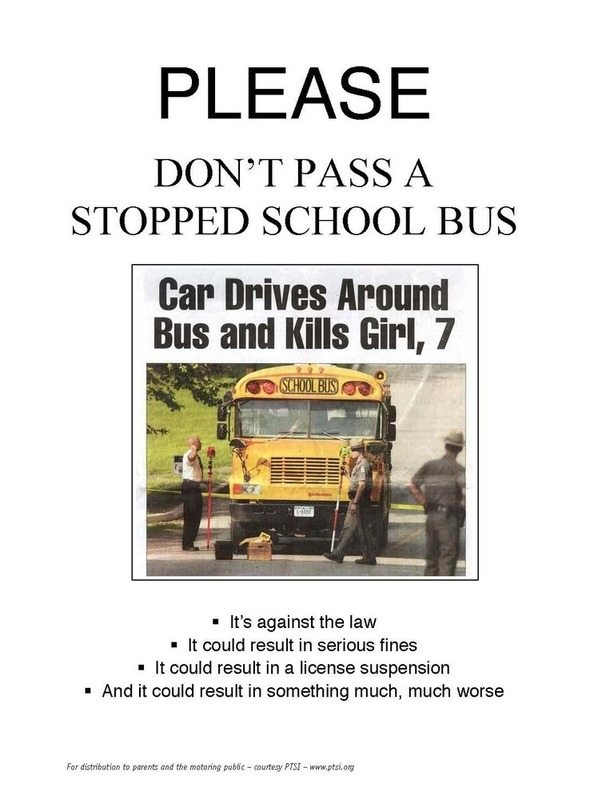 In a one day survey conducted by the Indiana Department of Education (April 26, 2017) a total of 2280 incidents of stop arm violations were reported by bus drivers in 145 school corporations (about one-half of the school corporations in the state). This is an ongoing danger and problem. It is up to everyone, but especially those who have the privilege of driving on our roadways, to be careful and share the roads responsibly with others. Nothing is so important - time, a phone call, text message, or anything - that you risk hurting others by passing a school bus when its stop arm is out and flashing. Our thoughts and prayers are with the Tippecanoe Valley School Corporation community as they grieve their tremendous loss.